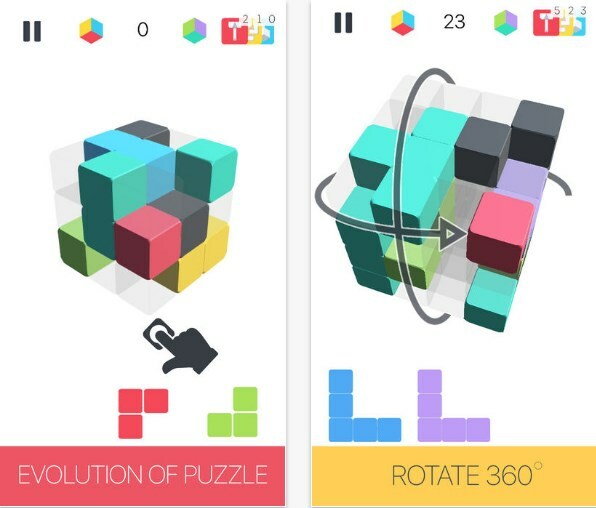 Puzzle games occupy a unique position right at the very center of mobile gaming. As long as there have been phones with screens there have been abstract brain ticklers to help while away idle minutes. Naturally, the genre took a massive step forward with the arrival of the smartphone. The App Stores are packed full of brilliant puzzle games, but we chose one to present to you today – an amazing game called Xcube. It is a unique and exciting Tetris/Rubicks based puzzle game developed on the iOS and on the Android platform. It is a very challenging and fun game for players that want to push themselves harder and have fun at the same time; Xcube takes the puzzle gaming experience to a whole new level, so read on and find out how to play. Xcube is easy to play, but hard to master. Fill a 360 degree rotatable cube with the given objects, fill a horizontal or vertical line and see it destroyed. Clear sides of the cube to place new shapes. Be careful when clearing, always leave area for incoming shapes. By destroying lines you earn score until cube is filled and there is no place for the incoming objects, then you lose the game. If you choose the harder mode (Color mode) you will get into colorized world where you have to fill the color based faces with the matched color. But be careful when you add shapes into one corner, you are blocking another side of the cube. Pick your game concept, personalize your cube by picking the themes and art styles, and download Xcube for free from Google Play or from the App Store.